Endnotes can be found in the PDF. We know very little about how former Massachusetts Gov. Mitt Romney would reshape U.S. foreign policy or defense priorities if he were elected president. He has not elaborated a long-term vision or outlined the details of his plans. But what little we do know from his few public comments is troubling. Gov. Romney’s defense plans would be prohibitively expensive. He has pledged to set the Pentagon base budget (not counting war funding) “at a floor of 4 percent of GDP,” which would result in at least $2.1 trillion in added spending over the next decade compared to the Department of Defense’s current plan. Gov. 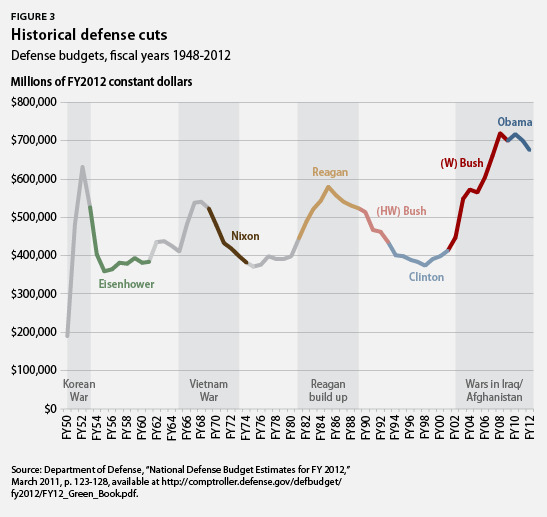 Romney has not elaborated on what specific threats prompt him to call for this huge increase in defense spending. Gov. Romney has also pledged to increase the Navy’s shipbuilding rate from 9 per year to 15 per year, add $50 billion per year in spending on modernization, establish a multilayered ballistic-missile defense system, and add 100,000 personnel to the Army and the Marine Corps above 2010 levels. Again, he has not explained how he would pay for these initiatives or which threats they are meant to address. Meanwhile, Gov. Romney says he would cut marginal tax rates for individuals by 20 percent and balance the budget. He has embraced Rep. Paul Ryan’s (R-WI) budget plan and said he would cap federal spending at 20 percent of GDP but exempt Social Security. To keep these various promises, he would have to cut nondefense programs other than Social Security, such as Medicare and Medicaid, by 59 percent over the next decade. Thirty-two years and eight presidential elections later, voodoo economics has returned to the Pentagon’s fiscal course. And while Gov. Romney would spend trillions countering threats from a bygone era, he hasn’t outlined a serious agenda to address the two greatest long-term problems facing the Pentagon: poor management of Pentagon procurement and rapidly growing Department of Defense personnel costs that put the All-Volunteer Force at risk. Similarly, in its fiscal year 2013 budget request, the Obama administration outlined a plan to reform the Tricare military health care program and bring military personnel costs under control. Again, Gov. Romney has failed to engage on this issue. To sum up, focused on Cold War-era threats, Mitt Romney’s plan for the Pentagon would run up the deficit while shirking the tough choices necessary to prepare the U.S. military for the 21st century. We examine what little we know about his defense plans in this brief. Following a decade of unrestrained growth in the base defense (nonwar) budget, two costly wars, multiple tax cuts, and the worst financial crisis since the Great Depression have combined to leave the country confronting serious long-term fiscal problems. Adm. Michael Mullen, the previous chairman of the Joint Chiefs of Staff, named the deficit as the biggest national security threat facing the country. The nation has historically responded to such circumstances through a combination of spending reductions and revenue increases. 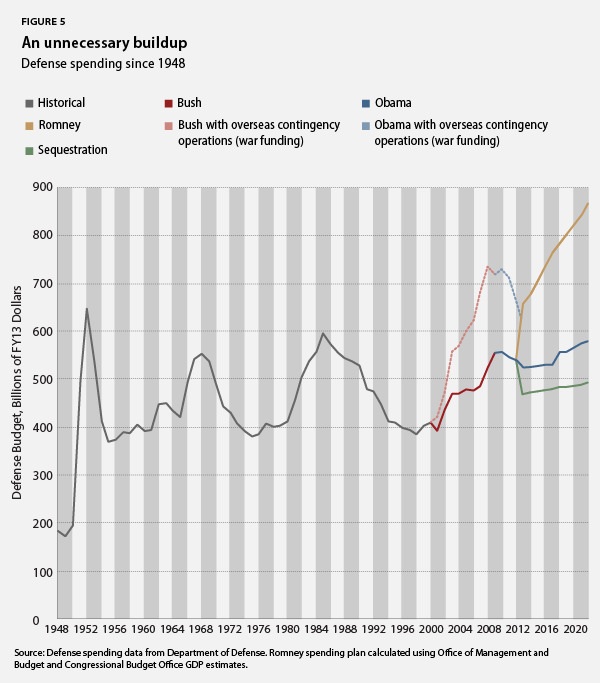 As illustrated in Figure 2, the historical balance between revenues and outlays was overturned by the recession and President George W. Bush’s wars and tax cuts. While President Obama’s plans would gradually restore this balance, Gov. 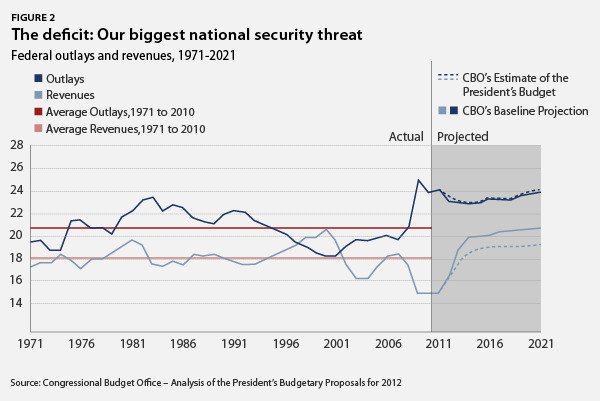 Romney’s spending and tax-cutting plans would push the country further from the path of fiscal responsibility. We are also coming to the end of a decade of war and rising defense budgets. After 9/11, defense spending increased dramatically, rising from $410 billion in FY2000 to $738 billion in FY2008, the last year of the Bush administration—an increase of $328 billion or 80 percent in constant (inflation-adjusted) dollars. This brought defense spending to levels not seen since World War II, 50 percent above peak spending during the Korean War and 78 percent above the Vietnam War peak. The United States has historically drawn down the defense budget following major conflicts. Figure 3 presents the history of those drawdowns, overseen by past presidents of both parties. A majority of Americans support cutting the defense budget in line with this precedent now that the wars in Iraq and Afghanistan are coming to an end. Against this backdrop, Gov. 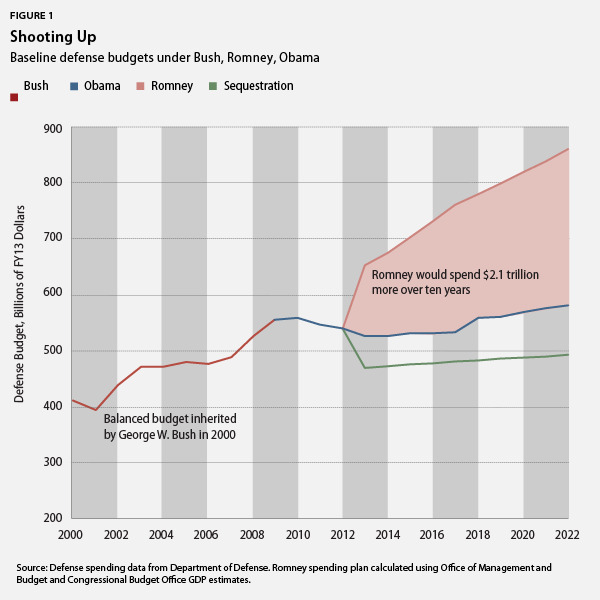 Romney would vastly increase military spending over the next decade but has said very little about how, exactly, these added funds would be used or why they are necessary. Let’s examine the details of his pledges. Mitt Romney’s pledge to set core defense spending at a floor of 4 percent of GDP would make the United States less secure by undermining the economic health that underpins American strength abroad. His plan ignores fiscal realities and is not based on sound strategy or a realistic assessment of the threats facing our country. 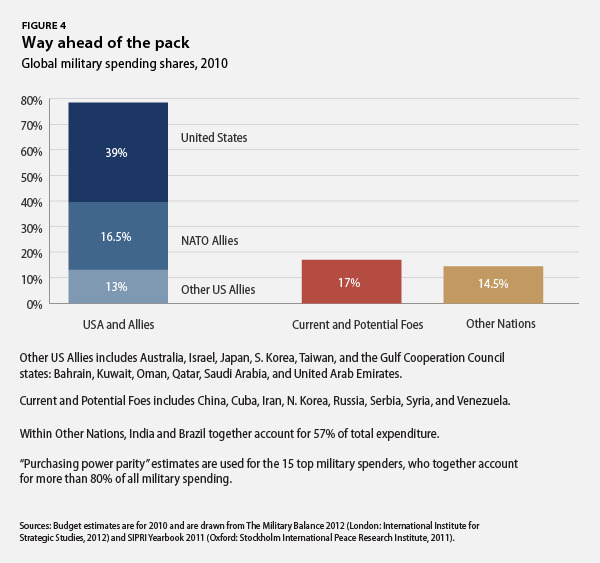 The United States and its allies account for an overwhelming share of global military spending, far more than any potential adversaries, as illustrated in Figure 4. In FY2011 the United States alone spent significantly more on defense than the next 10 countries in the world combined, most of whom are our allies. We spent 800 percent what China spent on national defense in the same year. We have 11 operational aircraft carriers; no other country has more than one. We have more nuclear-powered ballistic-missile submarines and many more nuclear-powered attack submarines than any other country. We have more than twice the number of modern battle tanks of our closest competitor and more modern armored fighting vehicles than any other nation. We have three times more fourth-generation tactical aircraft than any other nation and are the only country currently fielding a fifth-generation model. Our superiority is complete when it comes to attack helicopters, transport helicopters and aircraft, tankers, drones, and satellites. These facts show the United States can maintain and strengthen its military superiority without bankrupting the nation. In response to the Budget Control Act, President Obama has outlined a long-term plan for the Pentagon that would keep defense spending roughly steady for the next five years and gradually increase it thereafter. As the funding for the wars in Iraq and Afghanistan declines and economic growth picks up, this plan would return the Pentagon to a reasonable, sustainable posture that matches the threats we face. Measured against historic drawdowns, President Obama’s plan would represent a very modest slowing of the growth in defense spending. In contrast, Gov. Romney’s plan would lead to at least $2.1 trillion in added spending over the next decade compared to the Obama administration’s current plan and nearly $4.6 trillion over the levels mandated by the Budget Control Act if Congress does not replace the current law. Demonstrated in Figure 5, this plan would represent a huge military buildup on top of more than a decade of increases to the defense budget—all while cutting marginal tax rates for individuals by 20 percent, balancing the budget, and capping federal spending at 20 percent of GDP. Finally, budgeting as a percentage of GDP is a misguided approach to defense spending. Defense spending should be based on the threats to our security. And because GDP varies based on economic conditions, pinning defense spending to GDP makes it difficult to plan long-term investments and means that spending levels are set according to economic performance, not strategic judgments. The Romney campaign criticizes the state of our military’s weaponry, arguing, “The Obama administration’s cuts have left us with a military inventory largely composed of weapons designed forty to fifty years ago.” This statement ignores the Pentagon’s existing long-term modernization plan. First, the research, development, testing, and evaluation, or RDT&E, process for new weapons systems takes many years. The actual acquisition process to purchase and field a whole new class of ships or production line of tanks or aircraft takes many years more. So while many of our aircraft and ships began development decades ago, that doesn’t mean they are obsolete. For instance, both the F-22 Joint Strike Fighter and the V-22 Osprey began development more than 30 years ago, but are presently cutting edge systems. Second, given the time it takes to deploy new systems, blaming perceived inadequacies on the Obama administration is factually incorrect. The Obama administration has not canceled any major weapons program, though it has slowed the projected acquisition levels of some programs in response to technical problems. Third, the sensors, communications, and armaments of these platforms have been constantly improved, and many of the airframes and hulls we actually use today were built more recently than Gov. Romney argues. More importantly, the United States can afford to be deliberate and careful in developing and deploying new systems. As noted above, our current generation of platforms—across all the services—is far superior to anything fielded by any potential adversary and more than up to the requirements of our national security. Throwing more money at the problem will only exacerbate waste and mismanagement. Moreover, the Pentagon’s budget for procurement and RDT&E, used to develop and purchase new equipment, has roughly doubled over the last 14 years, growing from about $117 billion in 2000 to nearly $229 billion today, in constant dollars. Over the next decade the Obama administration plans to buy 2,006 F-35 Joint Strike Fighters for the services at a total cost of $251 billion; five of the latest Virginia-class nuclear attack submarines for $17 billion; two of the new Ford-class super-carriers for $14 billion each; and 98 V-22 Osprey tilt-rotor aircraft for $9 billion, to name just a few big-ticket weapons programs. Gov. Romney argues that the U.S. Navy “has only 284 ships today, the lowest level since 1916.” The claim betrays little understanding of the modern Navy and, once again, dismisses the judgment of our top naval planners. His remark earned Pulitzer Prize-winning fact-checker PolitiFact’s infamous “Pants-on-Fire” rating for dishonesty. 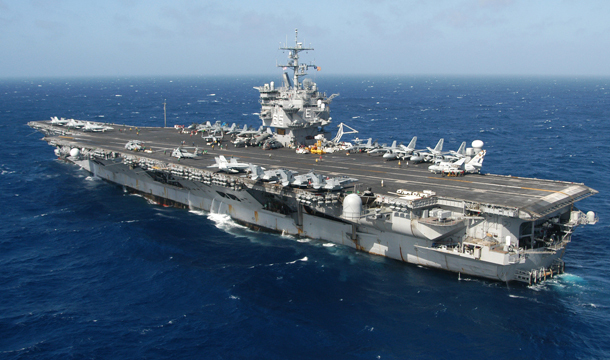 First, the Navy is larger today than it was from 2005 to 2008 (the second Bush term), so Gov. Romney’s statement is false. But beyond that, measuring the Navy’s strength solely in terms of the number of ships ignores vastly improved capabilities and increased tonnage, the usual measurement of naval size. As Chief of Naval Operations Adm. Jonathan Greenert recently wrote, technological improvements mean that, “Instead of sorties per aimpoint, we now commonly speak in terms of aimpoints per sortie.” In other words, the Navy can engage and defeat more targets today than it could in the past. One Aegis missile cruiser or Nimitz-class supercarrier wields exponentially more—and more sophisticated—firepower than ships from the early or mid-20th century. Second, our Navy today is larger than the next 11 navies of the world combined, many of whom are allies. Gov. Romney demonstrates little awareness of the realities of 21st century warfare or the global balance of power. Gov. Romney’s plan would add $5 billion per year to the Navy’s shipbuilding budget, or $50 billion in added costs over the next decade. He has not designated any threat to which this plan responds, nor heeded the expert analysis of U.S. naval planners. Gov. Romney expanded on this item in a speech to the Heritage Foundation, in which he set forth as a primary national security mission for our military the ability to “fight and win land wars and counter-insurgencies.” But this proposal is another example of ideas that would weaken U.S. economic strength without improving our security. Gov. Romney’s proposal would counter the Department of Defense’s efforts to craft a “smaller and leaner” force to deal with unconventional threats in the coming decades. In order to do this, the military plans to reduce active-duty end strength by about 100,000 through attrition and tighter recruitment policies. Gov. Romney would reject the judgments of our military planners to oversee a massive buildup of our armed forces just as we end two wars. Finally, his proposal would be extraordinarily expensive. The Pentagon’s 2012 plan would save $50 billion over the next five years. Gov. Romney has said he would reverse those changes, which would eliminate the savings and add long-term costs for training, operations, and personnel benefits. Gov. Romney’s plan to add 100,000 personnel would add huge costs to the Pentagon budget. It costs roughly $120,000 per year to maintain an active-duty service member, not counting the long-term personnel costs if that soldier is wounded or serves for more than 20 years. The Congressional Budget Office has estimated that the cost of 100,000 personnel reaches about $12.1 billion per year by FY 2015, meaning that Romney’s plan would conservatively cost around $100 billion over the next decade. Again, he would undertake this expenditure to address no specific threat and against the advice of our military planners. Despite paralysis in Congress, the United States is still one comprehensive debt-and-revenue deal away from guaranteeing strategic preeminence for the foreseeable future. The 2012 presidential campaign presents a stark choice between two very different plans for our nation’s approach to security and defense spending. Mitt Romney has offered a vaguely sketched vision of vastly increased defense spending and unilateral adventurism abroad. His plan would cost $2.1 trillion more over the next decade than the Obama administration’s plan. He promotes this approach while simultaneously promising to cut taxes and balance the budget, which is pure intellectual dishonesty. By exploding the deficit or gutting domestic programs, Gov. Romney’s plan would compromise our national security. His plan ignores the advice of our military planners and shatters historical precedent, all in response to security threats he has not deigned to specify. Gov. Romney has also failed to engage with various plans put forward to rein in military personnel costs or reform procurement, nor has he outlined his own reform agenda. Gov. Romney should outline the logic behind the massive military buildup he proposes. The American people deserve an explanation of the threats he sees that our military planners do not, his plan to pay for the buildup, how the funds would be spent, and what tradeoffs would be necessary in other areas of government. Lawrence J. Korb is a Senior Fellow at the Center for American Progress Action Fund.